Policymakers continue to struggle to figure out how to turn a troubled bank into a good bank and a bad bank. Under the good-bank/bad-bank policy, the good bank will operate free from concerns about troubled assets, because these assets will be held by the fully independent bad bank. Most discussions of the separation of a bank in this way presume that the government must inject a lot of new capital to create a well-capitalized good bank together with a still-solvent bad bank. The math seems simple–the troubled bank has almost no capital, so if the capital has to be split between the two banks, a well-capitalized bank will need new capital. But this math is incomplete. We can create a good bank with a big cushion of capital while keeping the bad bank as solvent as the existing integrated bank. The key idea–from Jeremy Bulow–is that the bad bank owns all of the equity in the good bank. 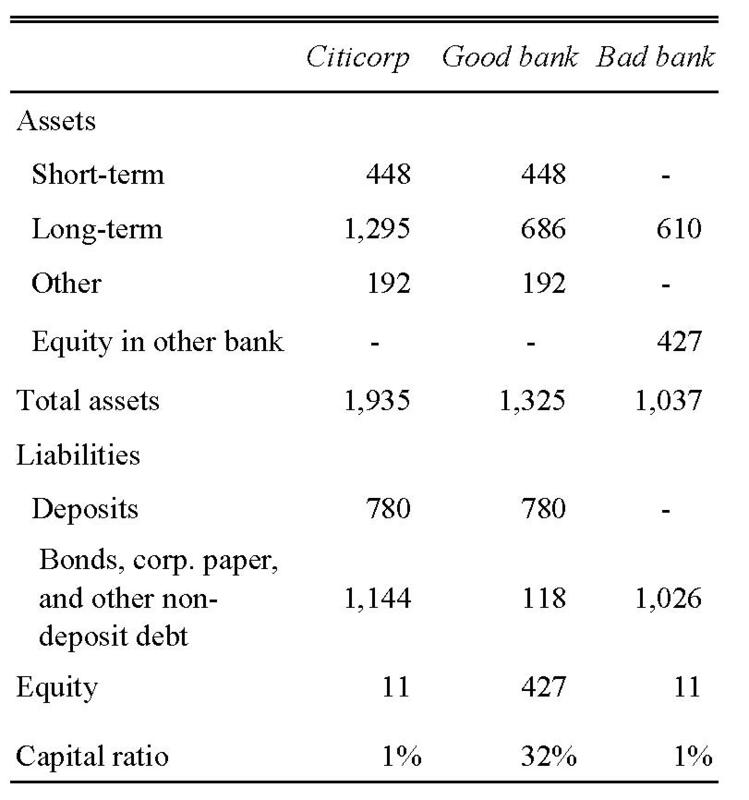 The left column shows Citicorp’s balance sheet roughly marked to market. The company’s value in the stock market of $11 billion is $76 billion less than reported book equity value. We deduct that amount from the reported value of long-term assets, which is where the troubled real-estate related assets are most likely to reside. The other two columns show the balance sheets of the new good bank and bad bank. The good bank will continue to operate under the Citi brands as a well-capitalized operating entity. The bad bank will be a financial fund with no operating functions. The good bank gets the short-terms assets and the “other” assets because many of these are related to its operating activities. It gets the better half of the long-term assets, taken to have book value, while the bad bank gets the poor half, where the impairment has already occurred and suspicions of further price declines persist. The bad bank holds the valuable equity in the good bank to the tune of $427 billion. The deposits remain as liabilities of the good bank. Because the good bank is heavily capitalized, the deposits are safe. Most are uninsured, so the creation of the good bank eliminates the danger of a run on the bank by those depositors. All of the debt goes to the bad bank. The holders of the debt were never promised a government guarantee. The shareholders in Citicorp become the shareholders in the bad bank. They are indirectly shareholders in the good bank as well, because the bad bank owns the good bank. The bad bank is thinly capitalized. In fact, it has exactly the same amount of capital that Citi had in the first place. With further declines in the values of the troubled assets, the bad bank may become insolvent. In that case, the bondholders will need to negotiate diminished values or the bad bank will need to be reorganized. In either case, the shareholders will lose all their value, just as they would have lost that value had Citi not been divided and there had been no further bailout from the government. The bondholders will lose part of their value, because there is no reason or justification for bailing them out. The key property of this approach is that neither the shareholders nor the bondholders suffer any impairment of their existing intrinsic values. At present, the shareholders own an out-of-the-money call option on the assets. The bondholders own the assets subject to the shareholders’ call. Their combined value declines by the amount of any further decline in the value of the troubled assets. As claimants on the bad bank, they would be in the same situation, sharing the same decline in value, with the losses of bad-bank shareholders equal to the losses of Citi’s shareholders absent the separation and the same for the bondholders. The adoption of the proposed good- and bad-bank separation would result in capital losses for the shareholders and bondholders, because the new policy would eliminate the benefit that they might receive from further bailout money from the government. The potential reorganization of the bad bank made necessary by future insolvency would not create any kind of financial emergency, so there would be no reason for the government to bail out the bad bank. There is no reason not to inflict the capital losses on the shareholders and bondholders, as they represent the capitalization of possible bad policies and are unrelated to the assets that the shareholders and bondholders actually own. Now one might wonder, given that the intrinsic claims of neither the bond holders nor the equity holders has changed, why bother? Pundits talk about the toxic assets in the banking system as if somehow they were infectious, and the good assets would become infected by the bad assets. One envisions the mold on one piece of cheese taking up residence on an adjacent piece in the frig. Or that somehow if the bad, hard-to-value, assets were moved somewhere else, both sets of assets would be easier to value and the banking system somehow more sound. We don’t think the bad assets are infectious. Nor do we think this re-arrangement increases or changes values or facilitates the valuations of the assets behind the banking system. What the change does do is make ever-so-clear what the priorities are in an insolvency. Note that in this re-arrangement, the debt claims, including the short-term commercial paper, are direct liabilities of the bad bank. If the bad bank cannot re-fund its commercial paper one morning, the bad bank must be re-organized. Some of its claims must be turned into equity. This is the standard sort of Chapter 11 re-organization. Thus, what this re-organization of the ownership claims does is show how easy and orderly a garden-variety Chapter 11 reorganization of a large bank could be, and how unnecessary it is to throw additional public money into insolvent institutions. And thinking about public money in insolvent institutions, consider that Citi’s present market cap of $11 billion (as of the close on Friday, 20 Feb 2009) includes the Treasury’s (that is, the public’s) investment of $50 billion in preferred stock (10/28/2008 and 12/31/08), and asset guarantees (1/16/09) are unambiguously underwater. At the most practical level, the advantage of the good-bank/bad-bank separation is to prevent the emergency that would occur if a large bank threatened insolvency. For Citibank, which has large amounts of uninsured deposits, which would remain in the good bank, the first symptom would be a run on the bank by those depositors. At that time, the pressure for offsetting the emergency by an injection of public money would be overwhelming. By contrast, no run would occur on the heavily capitalized good bank in our example. Reorganization could proceed peacefully while the good bank went about its banking business. The claims of the shareholders and bondholders, which are inferior to those of the depositors, can be sorted out without interfering with the operation of the bank. Much thinking about bank policy takes an old-fashioned point of view by assuming that a bank finances all of its assets through deposits. The good-bank/bad-bank separation has no advantage in that traditional setting. But for a bank that is mostly financed by non-deposit borrowing, moving the non-deposit liabilities to the bad bank has an advantage in dealing with insolvency. Citi break up – our questions! 6 Responses to "The right way to create a good bank and a bad bank"
Exactly,I posted an earlier outline of just such a plan over at Nouriel’s Page. I do believe, howver, that some of these ‘good’ banks will still some gov’t support.The real problems are political(gov’t and coprorate politics). The main accounting problem is how to account for the taxpayer funds already delivered. here’s the problem: the creditors whose claims you would allocate to the bad bank are themselves large financial institutions whose solvency/liquidity is dependent on the recoverability of those claims, now solely against the assets of the bad bank. inevitably the split of a citi into a good bank (capable of honoring its depositors claims) and a bad bank (incapable of honoring its creditor claims in full and as originally scheduled) will lead to a restructuring of the bad bank’s balance sheet as the toxic assets will prove insufficient to satisfy its liabilities, or certainly not on terms consistent with the current terms of those liaiblities. so it is the spillover effect of one large systemic bank on all the others, created by their interdependency as creditors of one another, that keeps the Fed and Treasury up at night and has lead to the indecision about how to tackle the clear need for balance sheet restructuring. Yep, in a kite-flying operation its all down to the guy holding the string (in this case, the ppl they loan money too). Once they let go of the string, its too late to redesign the kite, and even if you could it wouldn’t make a bit of difference. An interesting proposition. However the basic problem is that the functions of “merchant banking” and “commercial banking” have been merged into one entity. The average individual thinks that a bank takes deposits and makes sound investments and acts prudently and cautiously. This is the function of a “commercial bank”. What has happened is that the functions of commercial banking have been mixed with “merchant banking” and the merchant bankers have created $ 4 worth of IOU’s for every $ 1 of tangible assets and now the chickens have come home to roost. What is required is a complete separation of commercial banking activities from merchant banking activities and perhaps the prohibition of the use of the term “bank” in any entity that does not conform to the minimum standards of liquidity required in order to operate acommercial bank.There is not enough money to keep throwing it at the problem and sooner or later the IOU’s will be worth 25 cents in the dollar at best.